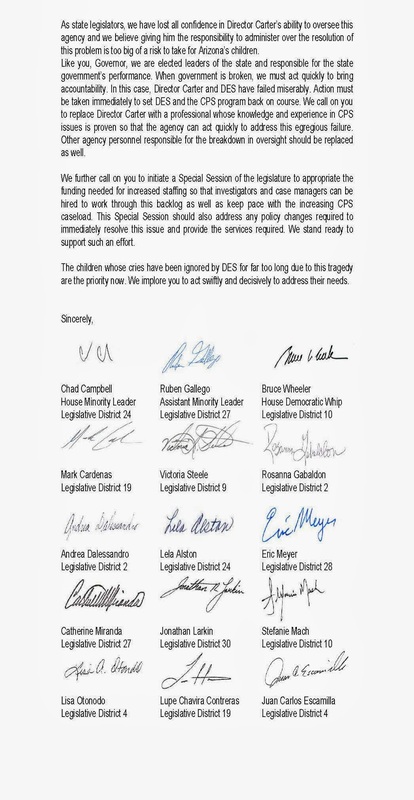 STATE CAPITOL, PHOENIX – House Minority Leader Chad Campbell, D-Phoenix (District 24), released this statement regarding reports that confidential documents from Child Protective Services were discovered in a Phoenix alley. STATE CAPITOL, PHOENIX – Senate Democratic Leader Anna Tovar, D-Tolleson (District 19), Rep. Mark Cardenas, D-Phoenix (District 19), and Rep. Lupe Contreras, D-Avondale (District 19), will join other community leaders and the Arizona Alliance of Community Health Centers in hosting Affordable Care Act Forums. Information will be available in English and Spanish about the new Health Insurance Marketplace, including ways to check eligibility, find a plan and enroll. This event is free and open to the public and to the press. For additional information call 602-926-3054. 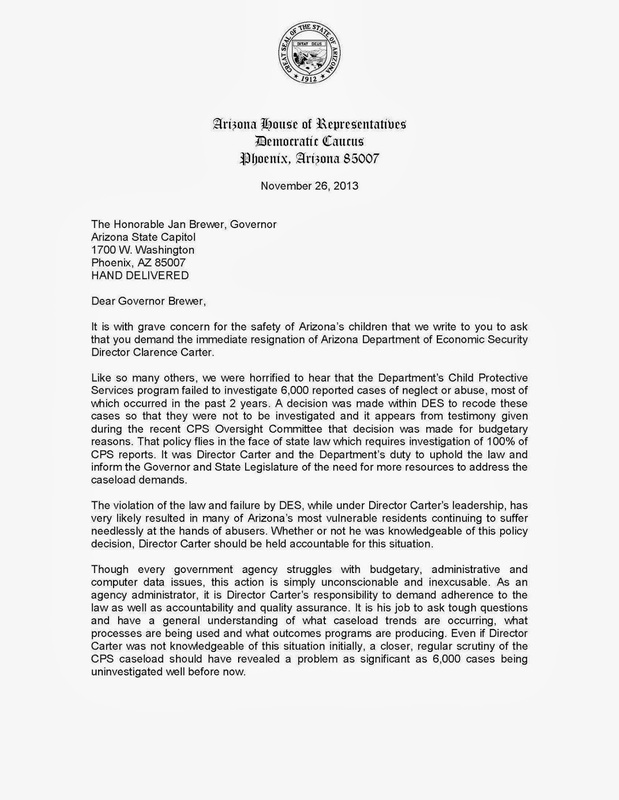 STATE CAPITOL, PHOENIX – Rep. Debbie McCune Davis, D-Phoenix (District 30), released this statement regarding the Department of Economic Security’s outline for reviewing the 6,000 unexamined Child Protective Services cases. “The document that DES Director Clarence Carter released late yesterday is a timeline, but what we need to see is a plan. He did not provide adequate information about who within the agency is investigating cases and how they are managing the additional investigations once cases have been properly coded. This response leaves too many questions unanswered. “It is still unclear how DES and CPS are realistically going to finish this job, and we don’t know what CPS is going to do moving forward. We also need to hear how the Department of Public Safety will be involved in examining the process by which cases were not investigated. I encourage Gov. Brewer to utilize the services of an outside partner to help the agency identify the problems that led to this crisis and to help restore credibility to the agency. 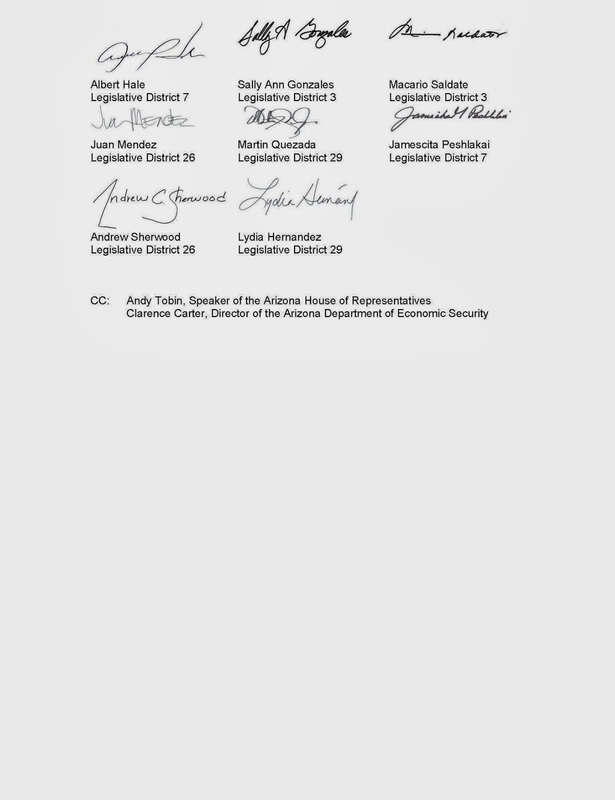 STATE CAPITOL, PHOENIX – Members of the Arizona House Democratic Caucus delivered a letter to Gov. 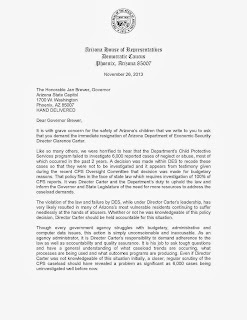 Jan Brewer today, imploring her to demand that Arizona Department of Economic Security Director Clarence Carter resign immediately after he confirmed that Child Protective Services has failed to investigate approximately 6,000 reports of abuse. House Democrats also urged the governor to call a special legislative session to appropriate the funding needed to hire more investigators and case managers to work through the 6,000 cases that have not been investigated and the 10,000-case backlog the agency previously reported. 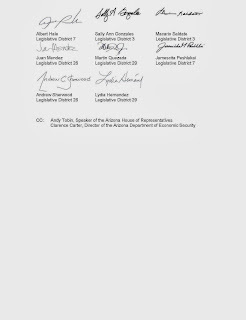 The letter, hand delivered to the governor, included signatures from 23 Arizona House Democrats. 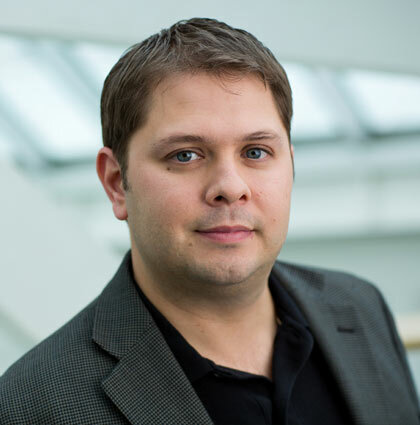 STATE CAPITOL, PHOENIX – Assistant House Minority Leader Ruben Gallego, D-Phoenix (District 27), is working on legislation that would regulate and tax marijuana in a manner similar to alcohol. The legislation would include a strictly enforced age limit for purchasing and using marijuana. It would also make marijuana taxable. 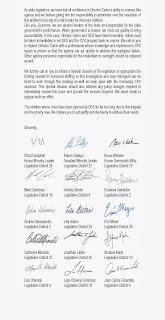 STATE CAPITOL, PHOENIX – House Minority Leader Chad Campbell, D-Phoenix (District 24), and Child Protective Services Oversight Committee member Rep. Debbie McCune Davis, D-Phoenix (District 30), released the following statements regarding the failure of CPS to investigate 6,000 child abuse allegations. “The CPS system is broken and it is failing children. Perhaps as many as 6,000 cases fell through the cracks because the agency has a policy that allows for some cases to go uninvestigated. Director Carter’s assertion that he is managing an agency with limited resources fails to address the fact that CPS has a statutory obligation to investigate all reports of child abuse. Ultimately, he is responsible for the agency’s failure, and he should be honest about the fact that a strategy was employed to reduce the number of cases referred to investigators. STATE CAPITOL, PHOENIX – Arizona Citizens for the Arts is recognizing Rep. Mark Cardenas, D-Phoenix (District 19), and Rep. Lupe Contreras, D-Avondale (District 19), as Legislative Arts Heroes for their work to get state funding for the Arizona Commission on the Arts. They were proponents of an amendment to the Arizona State Budget that provided a one-time allocation of $1 million to the Arizona Commission on the Arts, which restored some of the money the organization lost during the state’s budget crisis. The commission supports a statewide arts network and has faced severe cuts over the past few years. “A thriving arts sector is an indicator of a high quality of life, which is beneficial in attracting new businesses to our area. When we invest in art, we invest in the future,” Cardenas said. Each year, Arizona Citizens for the Arts honors legislators who support arts and culture in Arizona. Cardenas and Contreras will accept awards for their commitment to the arts on Friday, Nov. 22 at 6 p.m. during the opening reception for the 2013 Gallery 37 Students Project at the Tolleson City Hall, 955 W. Van Buren St., Tolleson, AZ 85353. For more than 30 years Arizona Citizens for the Arts, a charitable nonprofit, has promoted the importance of arts and culture in the state. For more information about Arizona Citizens for the Arts, visit www.azcitizensforthearts.org. For more information about the Arizona Commission on the Arts, go to www.azarts.gov. STATE CAPITOL, PHOENIX – Rep. Debbie McCune Davis, D-Phoenix (District 30), said Arizona needs to step up its consumer protections after the Consumer Financial Protection Bureau announced it is requiring payday lender Cash America International to refund $14 million to consumers nationwide and pay a $5 million fine for overcharging military members and robo-signing court documents. According to the CFPB, the company was robo-signing court documents in debt collection lawsuits. This is a process that involves having papers signed without review. The CFPB also reported that the company violated the Military Lending Act by charging service members and their families an annual interest rate higher than 36 percent on some loans. Arizona has not enacted a Military Lending Act enforcement statute as anticipated by the federal law. “This is the first action against a payday lender that the CFPB has taken, and as a result, Cash America will have to reimburse approximately 14,000 people for robo-signing court documents involved in debt collection lawsuits. This is good news for consumers. Cash America operates in Arizona as SuperPawn offering collateral and auto title loans. The Military Lending Act also protects consumers from pawnshops. “We have to do more in Arizona. My colleagues and Arizona Attorney General Tom Horne must support efforts to implement the Military Lending Act in the 2014 legislative session. I will introduce legislation that will enforce best practices that promote military consumer protection. If Arizona is serious about protecting service members and their families from harmful credit practices now is the time to act on this issue. McCune Davis added she agrees with the congressional testimony CFPB Assistant Director Hollister K. Petraeus gave on Nov. 20. McCune Davis praised the CFPB for providing consumers a place to go when they have complaints regarding consumer credit cards, mortgages, bank accounts and services, private student loans, consumer loans, credit reporting and money transfers. For information on refund eligibility, go to http://www.consumerfinance.gov/blog/our-first-enforcement-action-against-a-payday-lender/. UPDATE: In response to an outpouring of support, the Miranda family has established the Ben Miranda Memorial Donation Fund. Those wishing to contribute may do so by donating to the fund directly at any Wells Fargo location. STATE CAPITOL, PHOENIX– The office of Rep. Catherine Miranda, D-Phoenix (District 27), is releasing information regarding services for former Rep. Ben Miranda. Services will be held Monday, Nov. 25 at Saint Agnes Catholic Church, 1954 N. 24 St, Phoenix, AZ 85008 from 9:30 to 11:30 a.m. followed by mass. Miranda’s burial will take place at the National Memorial Cemetery of Arizona, 23029 N. Cave Creek Road, Phoenix, AZ 85024 at 2 p.m. Following the burial, the public is invited to convene at the American Legion Post 41, 715 S. Second Avenue, Phoenix, AZ 85003 to commemorate the life of former Representative Ben Miranda. Former Rep. Benjamin R. Miranda was a dedicated husband to Rep. Catherine Hernandez Miranda and was a devoted father to his daughters, Maritza Miranda-Saenz and Elisa Miranda. He was also the proud grandfather of Mariella, Abraham, Erin, Marie and Naomi. Ben and Catherine Miranda met while Catherine was teaching at a school in the Roosevelt School District. The school principal, a friend of Catherine’s, often invited Ben to her classroom to read to the children. After several of these visits, Ben invited her on a date and seven years later their love has continued. Monday, Nov. 18 was the couple’s seventh anniversary. Miranda grew up in a migrant farm family and was one of 11 children. He was born in Texas but traveled with his family across the country as they harvested different crops throughout the year. During this time he attended single-room schools and lived in camps with up to 5,000 immigrant farm workers. By the time he was 10 years old, he had attended more than 15 different elementary schools. Eventually, his family settled in Arizona, first in Gila Bend and then in Phoenix, where he humbly lived in the Marcos de Niza Housing Project. He graduated from Phoenix Union High School and then served in the Vietnam conflict for more than a year. One of Miranda’s proudest accomplishments was when the late Senator Barry Goldwater awarded him the Bronze Star, one of the country’s top military decorations for bravery, heroism or meritorious service. To live up to his dreams, he used his GI Bill to pay for his studies at Phoenix College and Arizona State University. He went on to receive a juris doctorate and the Dean’s Award from the Sandra Day O’Connor School of Law at ASU, where his efforts to recruit more minority law students yielded a 50 percent enrollment increase. Miranda was a practicing personal injury attorney, who had been helping Arizonans for more than 25 years. His goal was to ensure his clients were treated with dignity. One of the most noteworthy cases he worked on involved a 13-year-old girl who died from a ruptured appendix after allegedly being denied timely medical attention. This case had significant implications for the quality of medical treatment for low-income families in Arizona. Miranda was constantly asked if Ernesto Miranda from the famed case Miranda v. Arizona was related to him and he would reply that there was no blood relation, however, at one time, he was a client. Another high-profile client that Miranda worked closely with for eight years until his death was activist leader Cesar Chavez. During the course of his career, Miranda donated more than a million dollars to schools, community organizations and charities. Many of these donations were used for scholarships, teachers’ organizations, sports teams and legal advocates. Additionally, his firm, Miranda Law, donated thousands of hours of free legal advice to the community. His legacy of public service was recognized in 1994, when he received the City of Phoenix’s First Annual Dr. Martin Luther King, Jr. “Living the Dream” Award. Voters elected Miranda to the Arizona House of Representatives in 2002 and he served until 2010. While in the House, he was selected to be the chairman of the Arizona Latino Caucus several times. In 2007, the National Hispanic Caucus of State Legislators awarded him the John S. Martinez Leadership Award. NHCSL gives this award annually to a Hispanic legislator who exhibits passion, dedication and achievements in his or her political career. In 2012, Miranda was elected to the Maricopa County Community College District governing board, with about 60 percent of the vote. He was one of five members of the board that oversees the $1.5 billion budget and policies for 10 community colleges. He also served on the governing boards of the Roosevelt and Phoenix Union High school districts. Miranda leaves an inspirational legacy of community service. As a United Farm Workers attorney, Miranda was dedicated to helping immigrant workers get fair and equal treatment under the law. His commitment to this cause was so deep that in 1993 when UFW Founder Cesar Chavez passed away, Miranda paid to have his body flown back to Bakersfield, Calif.
Miranda had a passion for helping the underserved, which led him to establish Proyecto Manzana, or Project Apple, with the mission of promoting citizenship for its participants, advocating for human and legal rights and maintaining participation in education and civic matters of all its members. Miranda was also the co-founder of the Manzana Foundation, which helps students prepare for college. He worked with Rep. Catherine Miranda, his wife and a longtime educator, to develop this foundation, which partnered with the Navajo Technical College to extend accredited courses in the Phoenix area. Miranda shared his wife’s goal of ensuring that Dream Act students would have the opportunity to pursue an affordable education. Through the Manzana Foundation, he also provided high school and college students the ability to earn administrative experience with internships. Miranda often met with local, elected leaders across Central and South America. He also served on the boards of the Arizona Trial Lawyers Association, American Red Cross and Valle del Sol. In addition to hosting a weekly television program on legal issues, Miranda represented the City of Avondale, Pacific Gas and Electric, and Local 383, AFL-CIO. Ben Miranda’s dedication to his “pueblo” (people) will have a lasting effect on the community. His public service not only helped thousands of individuals but inspired many to pursue their dreams and give back to those in need. Miranda always lent a hand to support and assist others without expecting anything in return. The Latino community has not had a loss this impactful since the death of Cesar Chavez. A generation loses a leader, a friend, a family member but gains an immortal legacy by the name of Ben Miranda. STATE CAPITOL, PHOENIX – Rep. Andrea Dalessandro, D-Sahuarita (District 2), is organizing a series of Tele-Town Halls on the Affordable Care Act. She will hold the forums on two days, in both English and Spanish. The Tele-Town Halls in English will be held on Tuesday, Dec. 3 at 11:30 a.m. and at 7 p.m. The Spanish Tele-Town Halls will follow on Thursday, Dec. 5 at 11 a.m. and at 7 p.m. Participants can call 559-726-1200 and use the code 322773. Please note this call is not toll free. Long-distance charges may apply. Herb Schultz, the regional director of the U.S. Department of Health and Human Services, and Kim Van Pelt, a representative from St. Luke’s Health Initiatives, will join Dalessandro for both calls on Dec. 3. Theresa Gonzales, an Arizona Health Care Cost Containment System representative, will also be on the 11:30 a.m. call that day. Dr. Betsy Thompson and Roberto Diaz with the Centers for Medicare and Medicaid Services will be available for both calls on Dec. 5. These events are open to the public and the press. 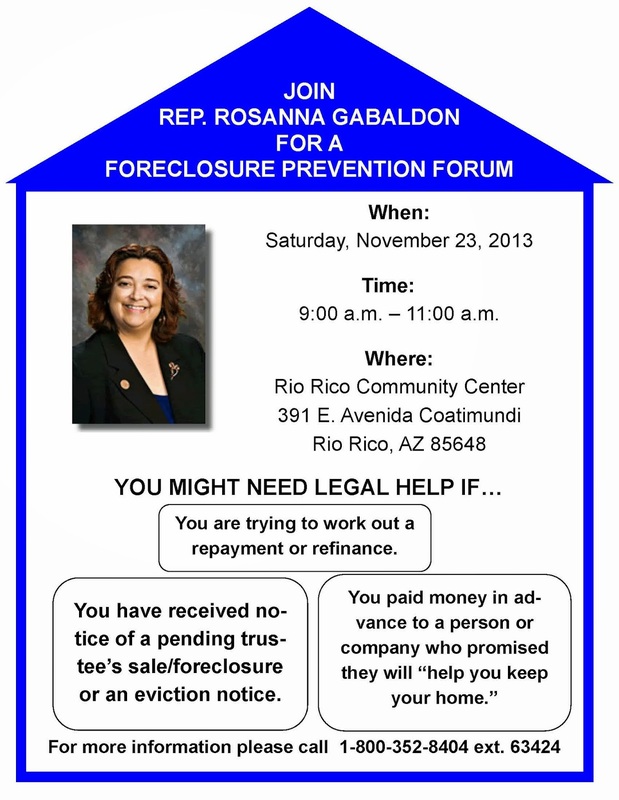 To RSVP, email adalessandro@azleg.gov or call 1-800-352-8404, ext. 65342. "From the streets of Los Angeles to the public schools of the Bronx, there is no state of the Union where Latinos are not becoming local leaders and responsible politicians. NHCSL unites the collective energy, leadership and experiences necessary to shape the future of our country. Our time is now, and I look forward to working with the newly elected leadership team to execute this mission", expressed NHCSL President, Senator Eduardo Bhatia (PR). This newly elected leadership team will serve for two years. The NHCSL Officers are charged with representing the organization’s member constituencies and serving as the voice of over 350 Hispanic state legislators across the country. Representative Minnie Gonzalez (CT) will continue to serve on the leadership team as Immediate Past President. The NHCSL is the premier national association of Hispanic state legislators working to design and implement policies and procedures that will improve the quality of life for Hispanics throughout the country. NHCSL was founded in 1989 as a nonpartisan, nonprofit 501(c)(3) organization with the mission to be the most effective voice for the more than 340 Hispanic legislators. For more information visit www.nhcsl.org. STATE CAPITOL, PHOENIX – Rep. Debbie McCune Davis, D-Phoenix (District 30), today applauds the Consumer Financial Protection Bureau for beginning to accept payday loan complaints. Consumers can also get answers to questions regarding payday loans at consumerfinance.gov/askcfpb or by calling 1-855-411-CFPB (2372). STATE CAPITOL, PHOENIX – House Minority Leader Chad Campbell, D-Phoenix (District 24), released the following statement about the Joint Border Security Advisory Committee led by the Tea Party. “The Tea Party is using the Joint Border Security Advisory Committee as a platform for extremism. This committee is wasting taxpayer and state resources to put on a partisan dog and pony show. “Improving border security is a serious issue that needs a bipartisan solution. The Tea Party is clearly not interested in that because no Democrats were invited to join this committee. Is that because they knew that we would challenge the outlandish claims and conspiracy theories being promoted with state resources during these meetings? Or is it because they knew we would support the few rational suggestions made by members of the public? STATE CAPITOL, PHOENIX - Rep. Lydia Hernandez, D-Phoenix (District 29), is hosting two community forums on Saturday, Nov. 9. The first forum will focus on the Affordable Care Act, and the second on comprehensive immigration reform. She will be joined for both by other elected and community leaders. STATE CAPITOL, PHOENIX – Assistant House Minority Leader Ruben Gallego, D-Phoenix (District 27), will join Phoenix City Councilman Michael Nowakowski and the Arizona Alliance of Community Health Centers in hosting an Affordable Care Act Forum for Phoenix residents. 212 E. Alta Vista Rd. This event is free and open to the public and to the press. For additional information call, (602) 926-9042. Gallego ofrece Foro Informativo sobre la Reforma de Salud con el Concejal Nowakowski y en colaboración con la Alianza de Arizona de Centros Comunitarios, la Cámara de Comercio Hispana, Enroll America, PAFCO y Valle del Sol. CAPITOLIO ESTATAL, PHOENIX – El Líder Asistente de la Minoría Ruben Gallego, D-Phoenix (Distrito 27), se unirá al Concejal de Phoenix Michael Nowakowski y a la Alianza de Arizona de Centros Comunitarios para ofrecer un foro informativo sobre la Reforma de Salud para los residentes de Phoenix. "La Reforma de Salud ha transformado el mercado de seguros médicos. Ahora, todos los Arizonenses, independientemente de sus ingresos, su edad o estado de salud pueden tener acceso a cobertura médica de calidad a un precio que puedan pagar", dijo Gallego. "Todos tienen derecho a una cobertura médica accesible, y por eso hemos organizado este foro. Hay mucha información sobre el proceso de inscripción y queremos asegurarnos de que las personas tengan la información correcta y la ayuda que necesitan para solicitar la cobertura médica apropiada”. 11 a.m. a 1 p.m.
Este evento es gratuito y abierto al público y a la prensa. Para más información llame al (602) 926-9042.